`Wishing is only the beginning’ sing the cast of tutti frutti and York Theatre Royal’s charming children’s show adapted by Emma Reeves from the Arthur Ransome short story based on the Russian folktale, The Little Daughter of the Snow. A more world weary version of this might take us into `Beware of what you wish for, it might just happen’ territory. But happily no such forebodings appeared on the horizon here in this appropriately wintery show that kept an audience of under-5s in the Lyric’s Studio well entertained – indeed so involved, it was all too much for some when grizzly bear growled through the auditorium and my young companion cupped her hands to her ears whilst another wailed and had to be taken out. Such is the power of the imagination and early suspension of disbelief, for your grizzly bear was only one of the actors – and actually the one playing a lovely Dad – clad in a rough brown rug. There is nothing, too, in Snow Child, unlike Grimm’s fairytales, to cast a shadow or disturb the young for too long. 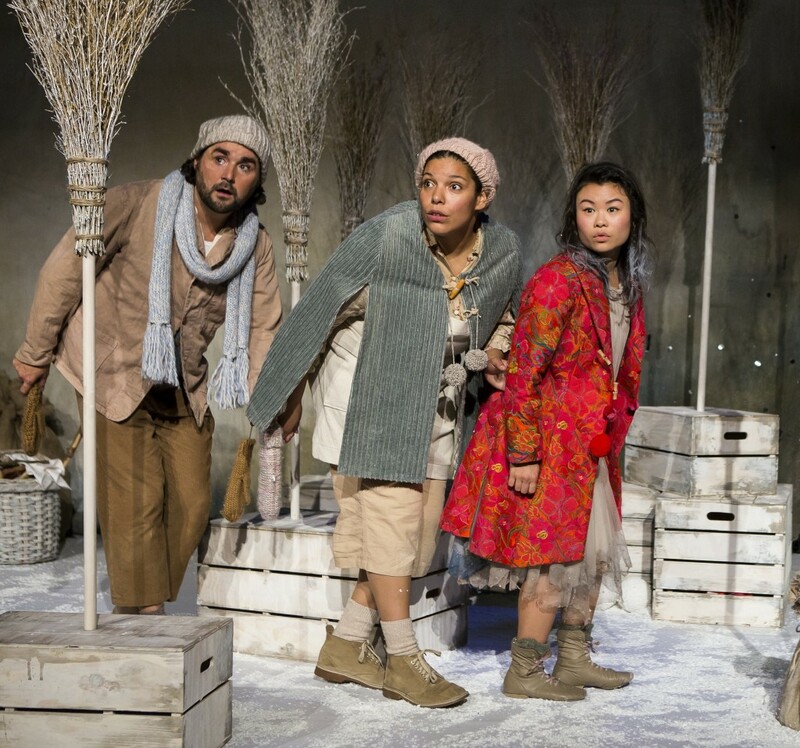 Indeed, the message of this Snow Child, adapted by Emma Reeves (of Hetty Feather, Carrie’s War and CBBC’s Eve series fame) is essentially one of safety – the safety of the family home. Again, the adult within might quibble, knowing as we do, the potential of `the family unit’ to set up nuclear reactions in terms of later life damage. But that is all in the future. Here, backed by Oliver Birch’s delightful music, tutti frutti’s production provides the trio of Mei Mac (a gamine Snow Child), Paula James and Mark Pearce with an inventive space in which to act out the story of two worlds clashing – Snow Child’s animal and forest world with her best friend, Fox – and the childless couple whose powerful desire for a child transforms a snow child into human form. Lots of scope here for commentary on humans – and parents – from a child and non human point of view and not missed by director Wendy Harris. Most affectingly perhaps is its ultimate message of family harmony coming from acceptance of imperfectability on both sides. Now, that is useful! 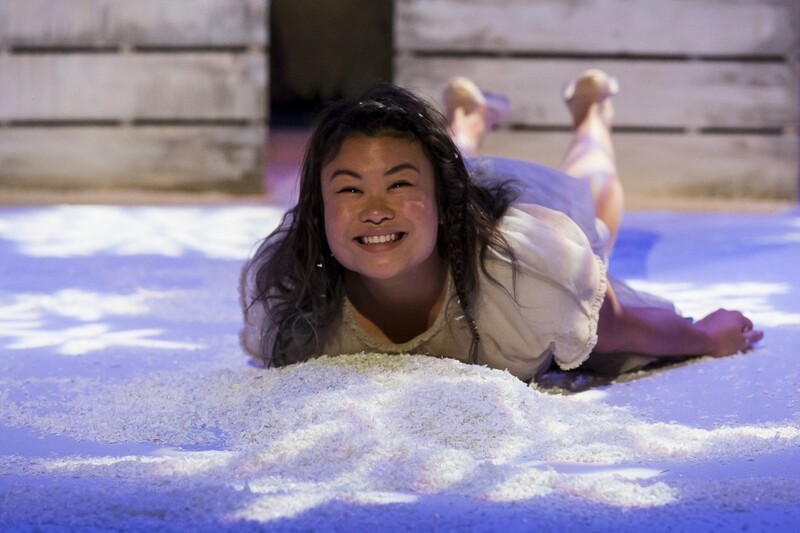 Snow Child is touring to Mar 5, 2016. See tutti-frutti for details. This entry was posted in 2016, Reviews and tagged Arthur Ransome, children's fairytale, Emma Reeves, family matters, Lyric Theatre Studio, tutti frutti, winter world on January 18, 2016 by Carole Woddis.